Veach-style Lens subpath perturbation strategy. This class implements a simple lens perturbation strategy as described in Eric Veach's PhD thesis. Construct a new lens perturbation strategy. This function exists to allow mutators to track their acceptance rate and other statistics. What kind of mutations does this mutator perform? muRec Data record that describes the mutation strategy, which transformed source to proposal. 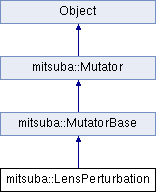 Given a path, this function produces a new proposal according to the internally implemented mutation strategy. source The sampling strategy implemented by the mutator will condition on this path. true upon success. When the sampling step is unsuccessful (this could happen due to various reasons), the function returns false. Determine the general "suitability" of this mutator for a given kind of path.